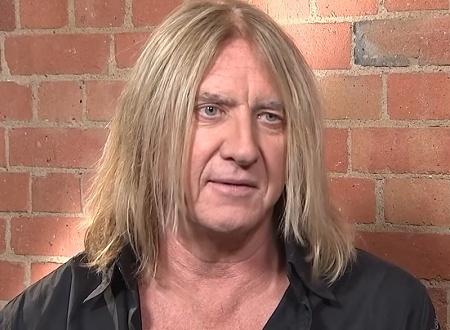 Def Leppard singer Joe Elliott was interviewed about the 30th anniversary of the Hysteria album last week and more video footage is available. Joe talked to TRT World news about the album's 30th anniversary and the new reissue. In a short three minute video Joe talks about the anniversary, UK success, 1986 Monsters Of Rock show, USA success, PSSOM and the huge sales of the album. Basically a longer version of the AP video from last week. View the short video clip below. "It hit Number One first week in the UK. So it finally nailed, you know, we had an opportunity here with an album that we'd done a lot of groundwork in the UK, but we'd never really been accepted. And then all of a sudden we were. I think you know after we did Donington the year before in '86, that was a big breakthrough moment for us and the UK audience. And they hung and waited until the following year for the album to come out. And it sold a million copies in the UK. I mean that's crazy." "It took a long time to really establish itself as a big record in America. It was ticking along, you know, it sold three million. Which is great for most people. The previous had done six, so they were like, there's still a lot of work to do here. And we kept putting single out after single and they were hits, but the Sugar really took it to the next level. And from after Pour Some Sugar On me was released and just went. It just went ballistic. I mean it really did, it was crazy. We were selling sometimes two or three hundred thousand albums a week." "I don't really keep much of an eye on that. I keep getting told it's at 22 maybe 23 million now. At the time it hit ten. When it was actively, as a release. I mean now it's a catalogue record that sells. But at the time that we were still promoting it or touring it. It hit 10 million by then, by the time the tour was done. Which was insane. I mean just five guys from England. It's like, really?. Now we're outselling The Rolling Stones and a lot of Beatles records. It was actually, you know, it wasn't something that we were getting big headed about. It was something (where) we were like going; 'Pinch yourself' because is this really happening?. It was a very exciting time."